And therein lies the rub, I believe. Because his competitiveness at summer camp is clearly not as pronounced. Sure, he likes to win whenever possible. And if he keeps losing at something, he stops wanting to play it, convinced it's too hard for him. Yet this insistence that the other player beating him must be lying or cheating seems to be confined to instances when that other player is his sister. I know this because I showed up a few minutes early to pick up my kids at sports camp one day this summer, when the campers were being awarded ribbons pertaining to their individual achievements at camp. Ribbon-giving was a weekly ritual at this camp, and every camper got a ribbon for something -- no doubt the pervasive influence of the positive self-esteem movement in American parenting. My son had come home with ribbons like "home-run derby champ," and "basketball passing MVP." But today he got one for "Best Sportsmanship." And according to the speech the counselor was giving, he'd been an all-around good sport all week -- which surely involved having to lose graciously to others. I'd likely still be picking my jaw up from the floor if I hadn't had to get the kids home and get back to work on some deadline or other that day. But it was that day when the light bulb clicked on for me. It's when he's playing against HER, his rival twin, that my son loses it. And he's not wholly to blame. His sister, though mostly a sweet, gentle, kind child, even an empathetic one when her brother is injured or sad, can be downright Machiavellian if she thinks she can manipulate someone to her advantage. I've noticed her insisting on comparing and contrasting her height, her speed on her bike, her abilities in swimming, to her brother's. Yesterday at lunch at a local deli, she and her brother both wanted my pickle. I didn't have a knife handy, so I split it with my fingers, and gave each sibling a pickle piece. It just so happened the piece I handed her happened to be a little bigger than the one I'd given to him, a fact I was hoping she wouldn't loudly trumpet to her brother once it was noticed. My hopes were immediately dashed, however. She simply had to point out that her pickle was larger, so she could relish (pun intended) this tiny triumph against the brother she nevertheless adores and from whom she draws security and strength by his very presence in her life. Yes, apparently she, too, has to be first in everything. The wise ladies who wrote the book suggest protecting little sore losers against playing competitive games with kids who do it better than they do, and when playing a game with them yourself, letting them win at least part of the time. So the other day, I made a point of playing a game with the boy -- luckily, it was a rare game his sister tends to lose, because it involves basic math, which he's particularly skilled at right now. She'd played one round with us both and given up. So it was just us two, which had been my original hoped-for outcome when we all sat down. I figured I'd have to let him win, but low and behold, he beat me anyway -- four times! It wasn't that I got the math wrong, but the dice seemed to favor the boy. He DID try to convince me he needed to re-roll the dice a couple of times when he didn't like what they gave him, and I nipped this in the bud on each occasion. But he won fair and square, again and again. He left the room triumphant. As for me, I'm trying to remind myself that even grown-ups don't like to lose ... and practicing doing so with equanimity is a lifelong task. So I'll cut the boy and his sister a little slack, and hope, as six leads to seven, eight, nine and beyond, that losing AND winning with grace and respect for your opponent is going to come with maturity. But till then, I'm damned if I'm playing UNO with those kids. They're ruthless. did you ever see my brother and me play a game when he was losing - up in the air went the game and all its pieces. My brother and I aren't twins, but we were obsessed with the idea of dividing evenly anything (including, I suppose, pickles) that was given to us. My father, an engineer, declared he'd never seen other engineers so precise in their measurements. Curiously, this early mania has proven useful in adult life, because Bernard (the youngest of four children) exhibits the same concern for portions — and the same skill in division and distribution. In 21 years of keeping house together, the only times I've gotten a bigger slice of the pie, it's been because Bernard has eaten his fill already. 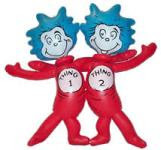 Still — congratulations on Thing 1's prize, and here's hoping Thing 2 decides she needs to keep up with him in sportsmanship, too! nabbed your 'ten ways younger mums are different from us' to put on my blog but put the link to your blog on it and recommended your site. If this isn't okay with you,please let me know!